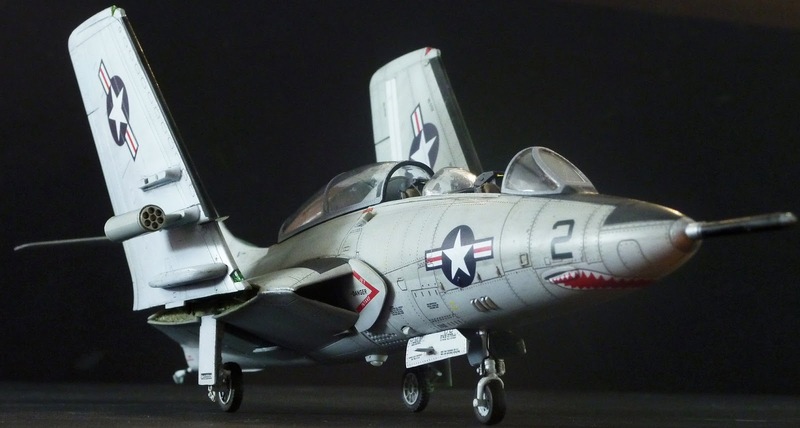 Available thru Kittyhawk@s Distributors Worldwide..
Kitty Hawk is on the dynamic side of modelling, with yet another new kit in 1/48. 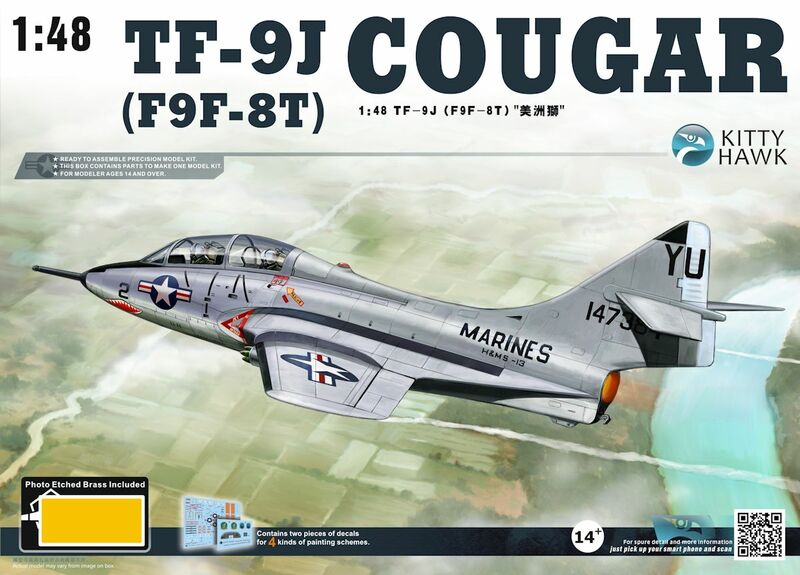 The Cougar is one of those aircraft that should have been available in 1/48 for a long time. Sure, FM released one ages ago, but that was pretty challenging to build and not easy to find. 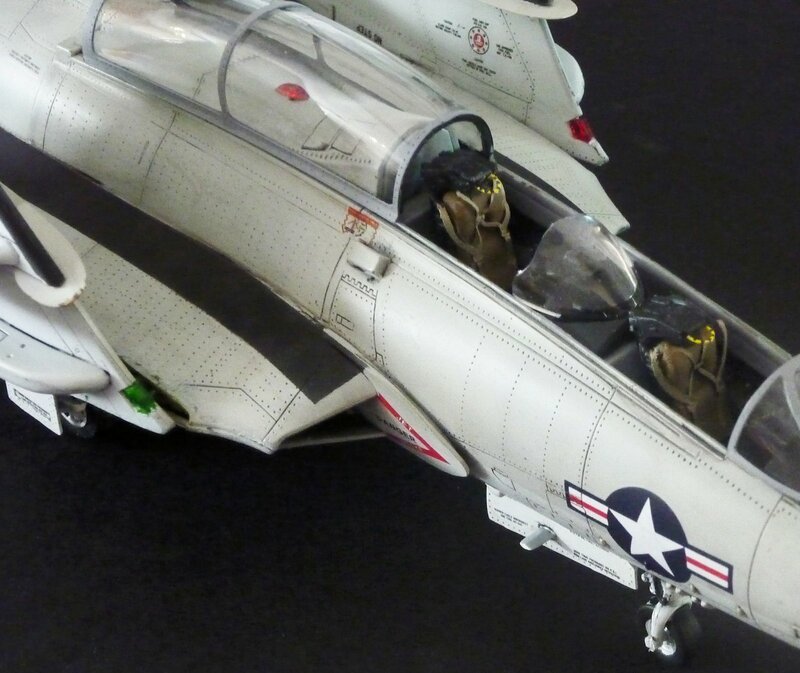 I do believe however, this is the first time a two seat version of the Cougar is available in this scale. 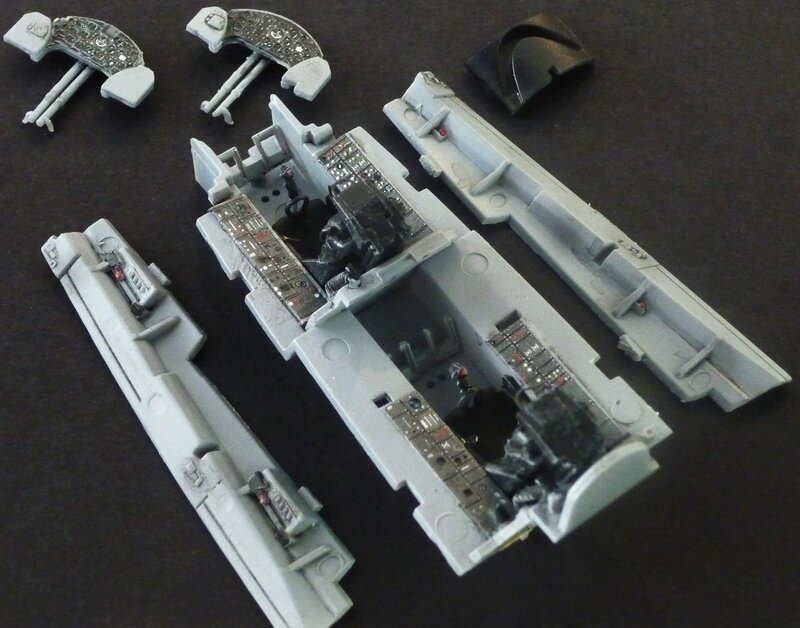 Opening the box of this TF-9J, the parts look very nice; I was very impressed with the panel lines and rivets. 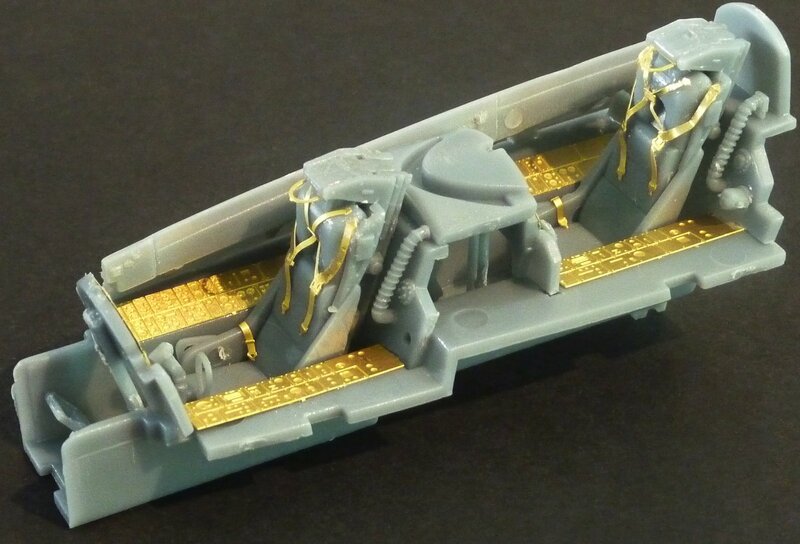 And although I sometimes can be the sort of modeller that just opens up a box and looks at the beauty of the parts, I wanted to know how this one builds. The first KH kit I built, was the T-6 and that went rather well, so hopes were high! You will find a nose weight inside the box too. 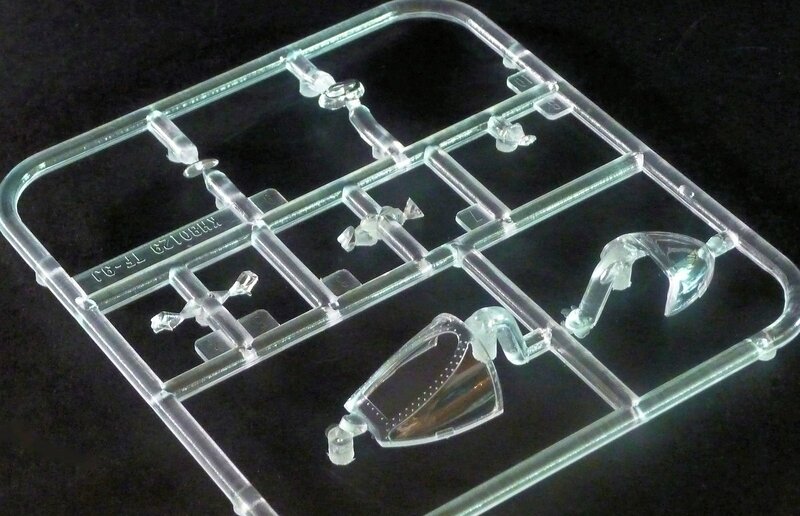 The clear parts in the kit are very clear indeed. 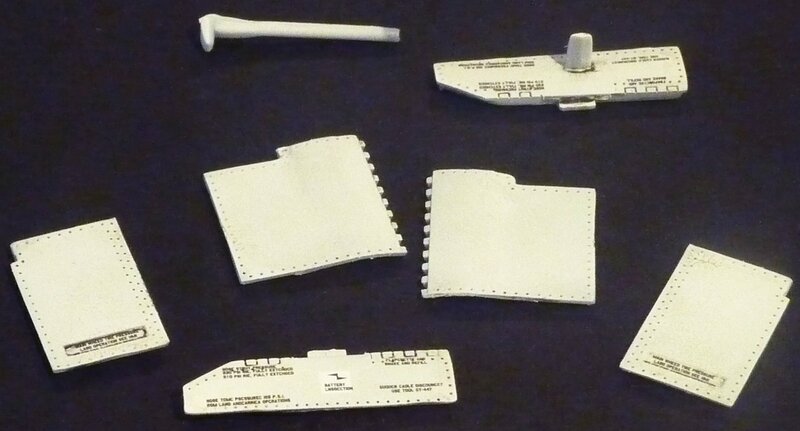 Right, about the parts of this kit: the fuselage is cut into 3 pieces, I hope that isn’t going to be a problem... 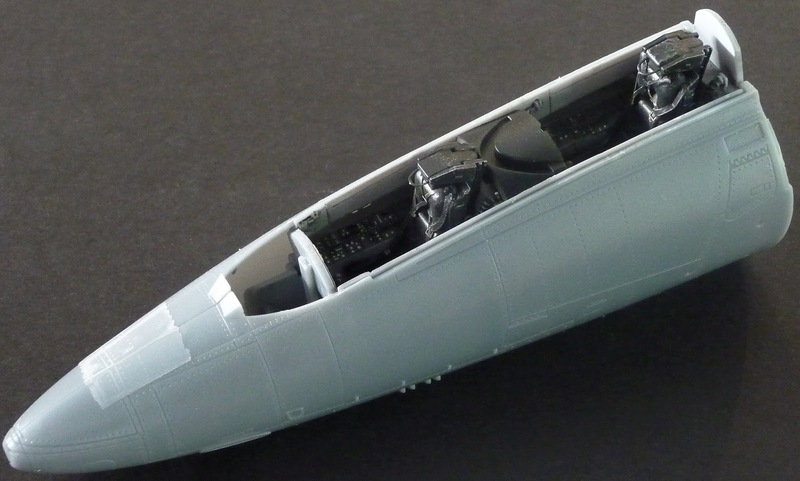 The front fuselage has some very nice surface detail. This is the same with the center-section of this kit. And with a little wash those rivets will come out great once the kit is done! 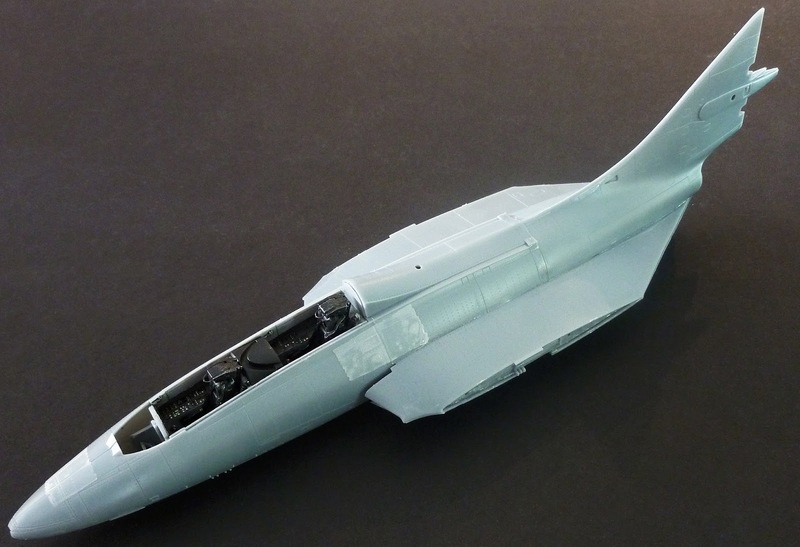 The aft fuselage parts look just as nice as the other parts. 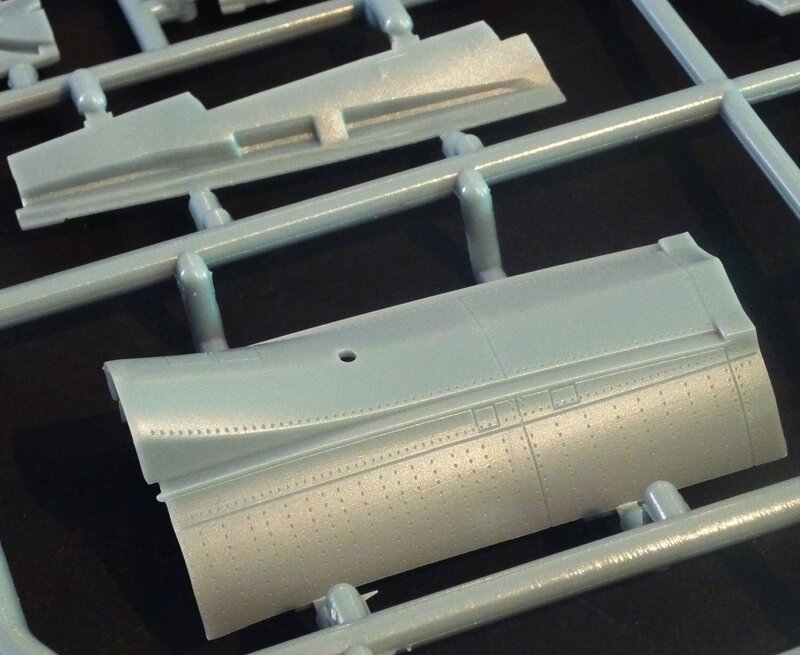 The large part on the sprue in front is the base of the front wheel bay and speed break bay. 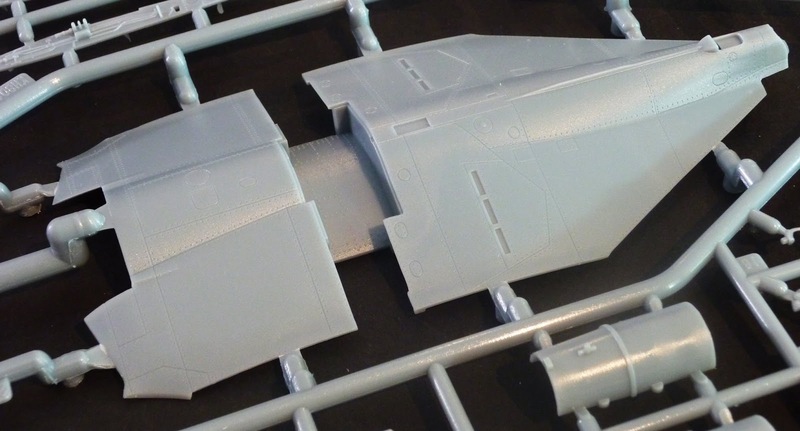 The lower fuselage part is the biggest in the kit. 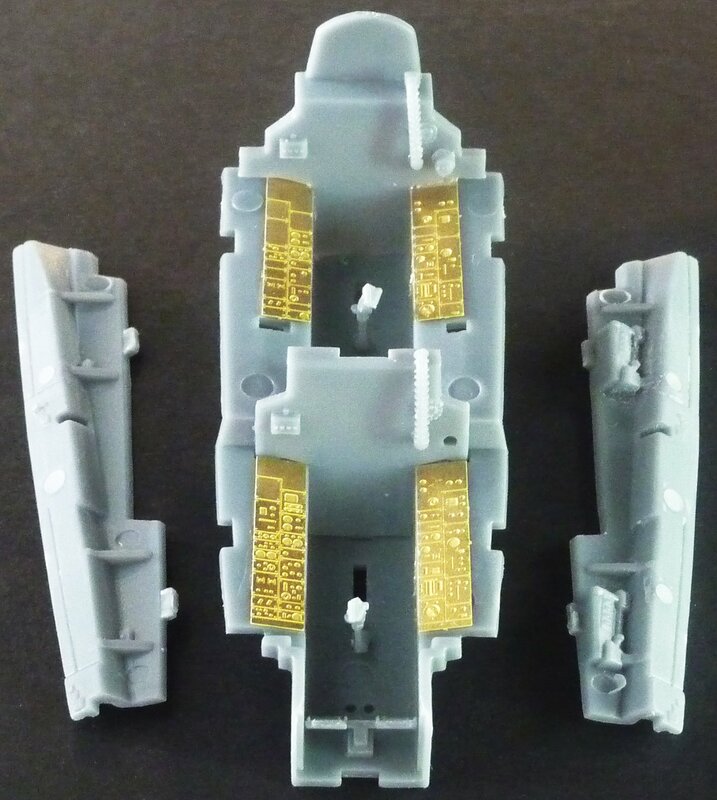 The smaller parts in this kit are pretty nice too, although some have injector pin marks in a nasty place, like the cockpit side walls, a very visible spot once the kit is done. Fortunately, this is easy to resolve; Tamiya putty and some sanding will take care of that. A point of criticism are the sprues (huh??) – they are big. I mean BIG-big. This makes it hard to cut the tiny parts and I had to take a lot of care not to break them. Maybe a thing for future releases? 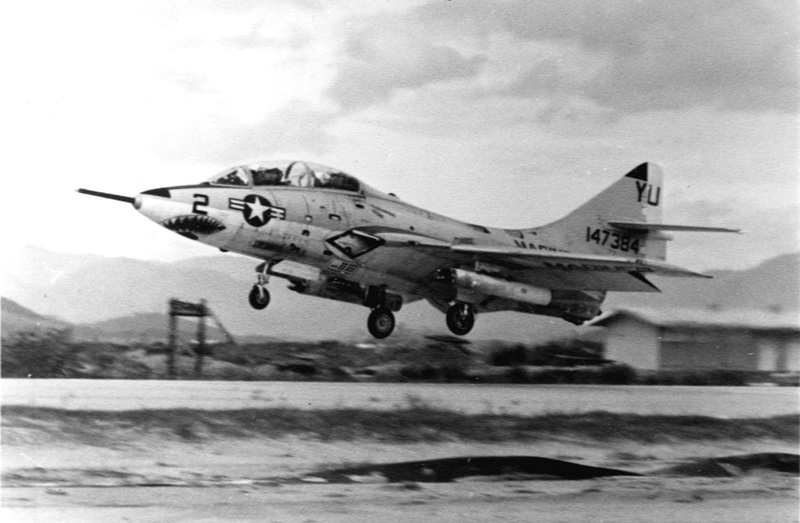 The kit offers the possibility to make one of four two seat Cougars. 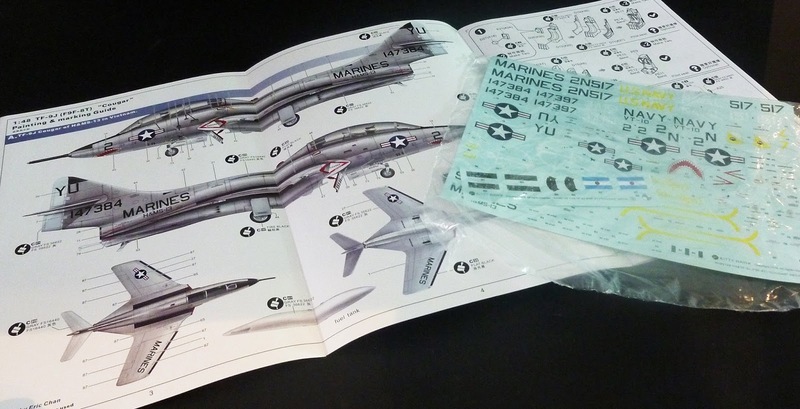 They are presented in a nice fold-out of the instructions. A word of warning here though: the profiles are not exactly in sync with the kit. 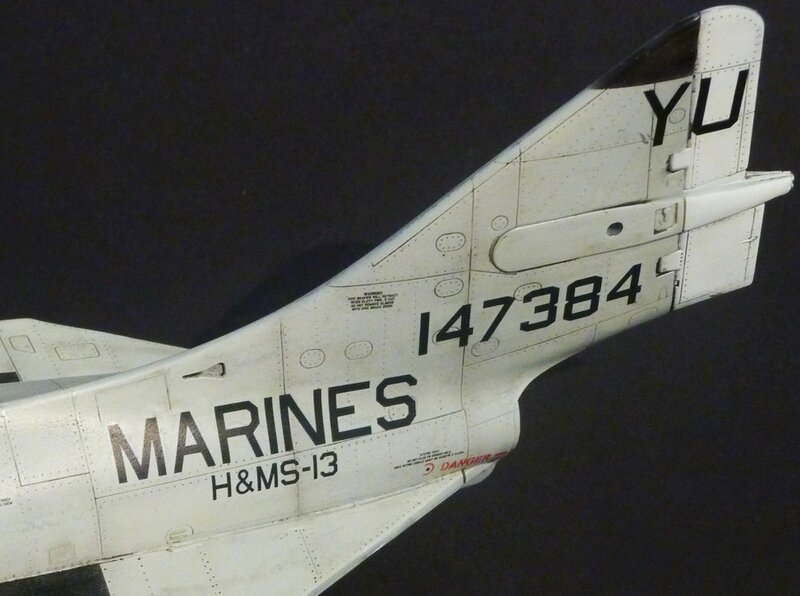 The details, like the wing vanes aren’t show on the profiles. 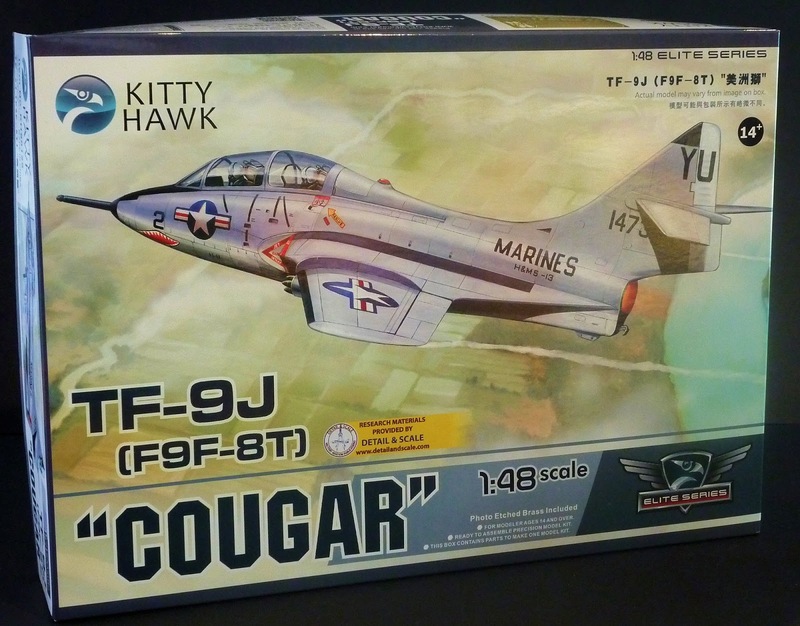 I picked the Cougar on the box – the one of the US Marines. I have always wanted to do a shark-mouth kit and here I had the opportunity. This is what this Cougar looked like on a mission in Vietnam. Time to build this kit. It’s one thing when the parts look nice, but how does it build? The cockpit of this two-seat Cougar looks a bit empty at first, but that’s just a first impression. 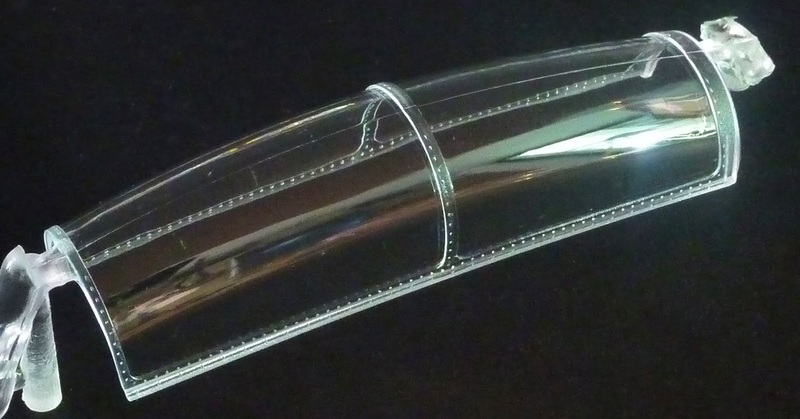 The tub has no raised panel detail; this is provided by either p.e. parts or decals. Always in for something different, I used both! Looks not bad, me thinks! As mentioned, the side walls with their injector marks have to be puttied. Here is the cockpit assembled with the seats and one side wall dry fitted. And this is what it looks like under a coat of paint. The seats only have a coat of black paint, the details have to be painted yet. Mounted in the fuselage, the cockpit looks the part. I’m sure A.M. sets will be available soon, but out of box, it works. With the cockpit mounted, it was time to do the fuselage. I couldn’t get the aft fuselage to fit properly because the pins in the middle section didn’t line up with the openings in the lower parts. So, I simply removed the pins and glued the part on top of the inner wing parts. That worked fine though. The front fuselage went on like a glove, I was really impressed. 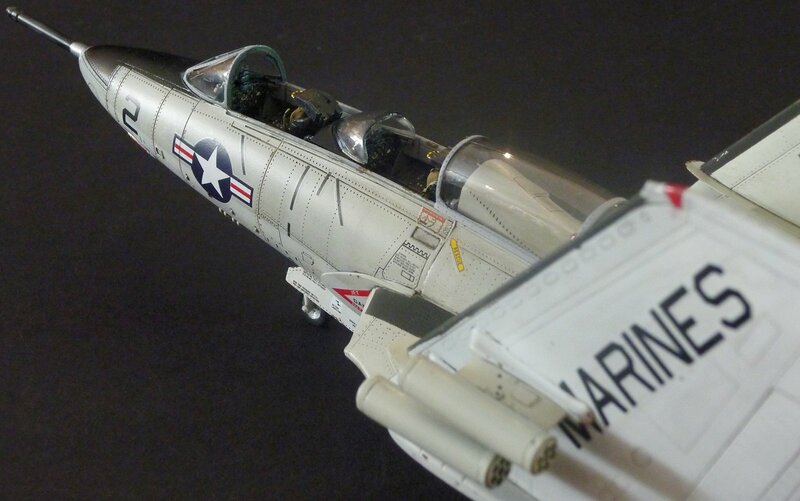 Actually, apart from the cockpit side walls, I didn’t need any putty for this Kitty Hawk kit. Now for some remarks on the details: the instruction tells you to glue an air scoop on either side, right behind the cockpit. You should however only do it on the starboard side (see the historical photo above). Painting the fuselage isn’t very hard. The only thing you need is Tamiya tape, because you need hard edges on the colours. Two shades of grey and black, some future and the decals went on. 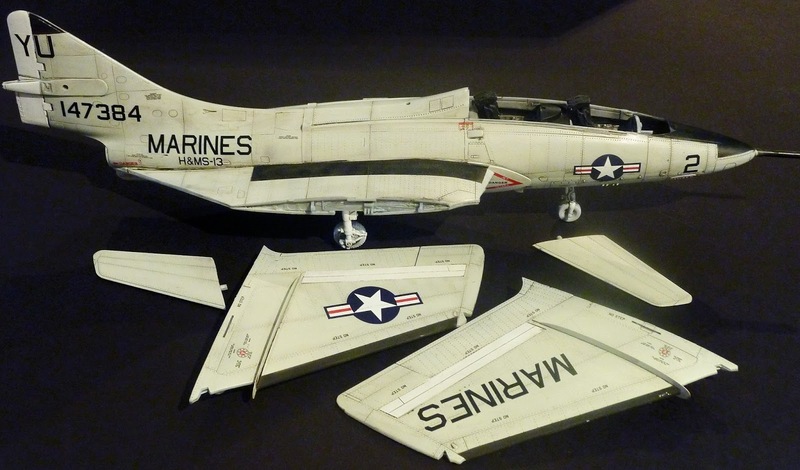 Having had the experience of the Kitty Hawk decals – very nice, but very hard to move when they are on the kit – I was very careful with them. In the end: no problems with them. This stage was followed by a wash. The nose gear in the kit seems like it is fully compressed, like the jet is ready to be launched of the deck of an aircraft carrier. 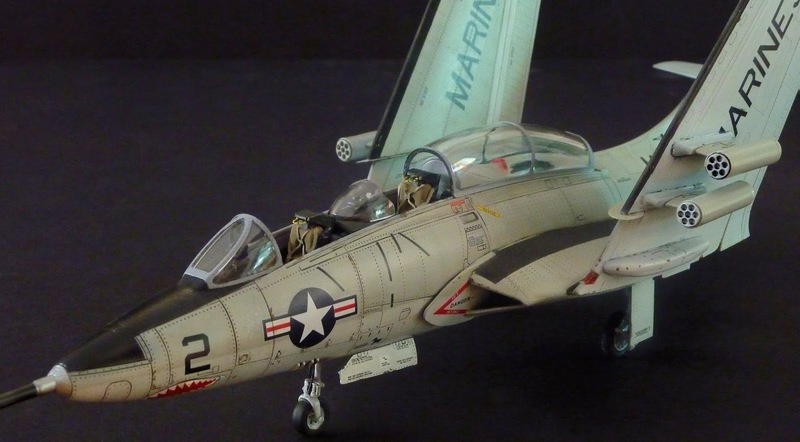 Having built the Fisher Models 1/32 kit of this aircraft and having checked photos, I found it more realistic to give it a nose up position, so I lengthened the nose gear and added a few details. Now, when you do this, you have to put more nose weight in the kit than provided. Next came the wings, and they proved to be very easy as well. The P.E. parts gave no problem and fit was okay! The wing fold detail does look the part, it only needs a coat of interior green and a wash.
With the wings and the fuselage done, it is time to get the attention to the details. So far, this kit went pretty smooth apart from the hick up on the aft fuselage. 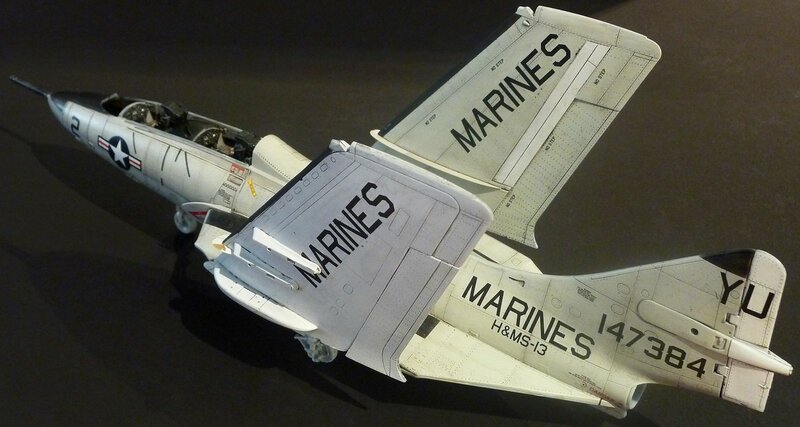 Folding the wings on a model often is a tricky thing. Whatever you do, it is a fragile part of the model. But here, Kitty Hawk has done a rather smart thing: the wings have like a vane that is 10 mm long and 1 mm wide, which fits perfectly in the inner wing. It’s not even necessary to glue the wings in the folded position for it to hold! 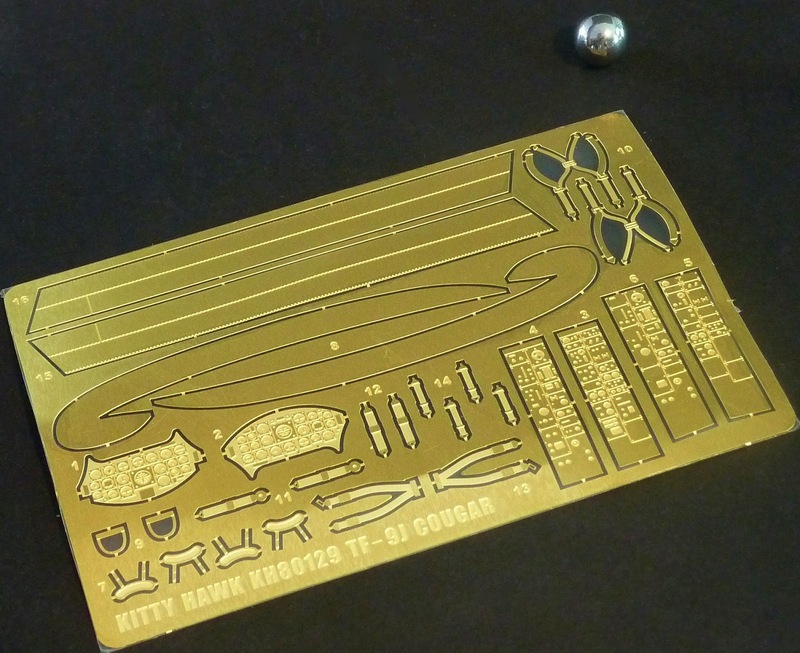 I like this new Kitty Hawk kit. Now, don’t get me wrong: you have to take care on the aft fuselage, because if you to do it like it is supposed to, you will have problems. Just cut of the pins that are supposed to fit into the lower fuselage and everything will go smooth. 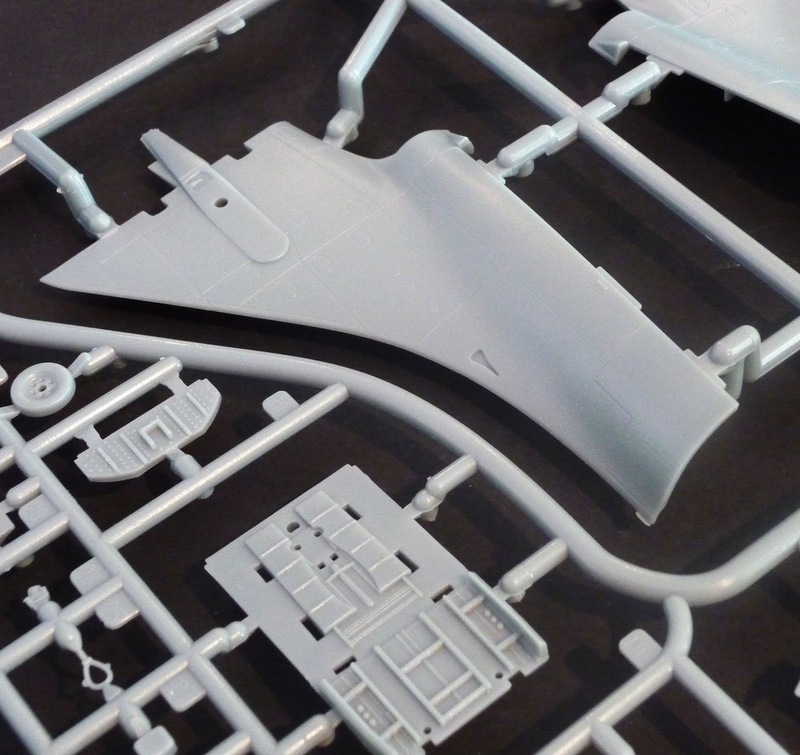 The good points of this kit are the surface detail, the wing fold system, the fit and the decals. 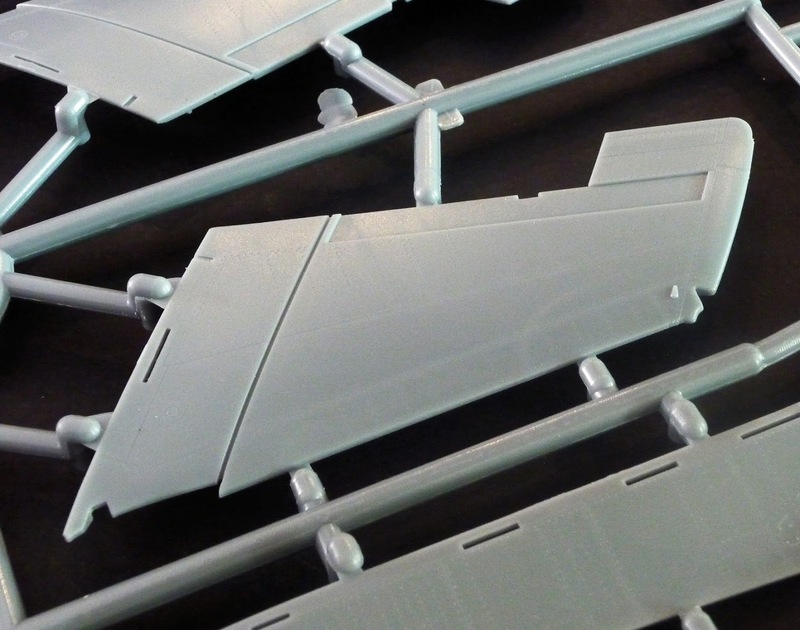 The lesser points are the position of the nose gear and fact that sometimes it is just hard to get the tiny parts of the sprues. Will I build another one? Well, if Kitty Hawk brings the single seat recce version (the one with the big nose) I probably will! 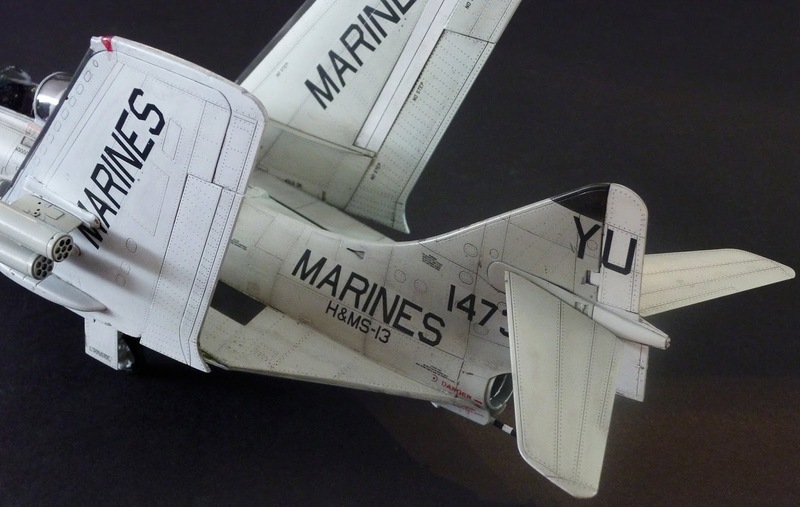 It’s a very nice kit to build, while waiting for that the September release of the 1/32 OV-10 Bronco will come cantering in!! Thanks to Kittyhawk for sending this out for Nic to build..